For over 100 years, Ruud has provided trusted, long-lasting solutions. We have made a habit of delivering reliable heating & cooling products focused on keeping you comfortable. No matter how advanced our engineering has become, we’ll always “make them like we used to.” With Ruud, you get a history of doing things right and our word that you can Rely on Ruud .The Ruud RGGE, RGFG, and RGJF Ultra Series™ 90 Plus Communicating Modulating gas furnaces equipped with the Comfort Control2 System & Contour Comfort Control line of Upflow /Horizontal, & Dedicated Downflow, are designed for installation in closets, alcoves, utility rooms, or attics. The design is certified by CSA International. Provides advanced service-ability with over 28 on-board diagnostics & fault history codes by detecting system & electrical problems. “Call for Service” alert notification is sent to the thermostat to alert the homeowner of required service. This includes dual seven segments LED & diagnostic history for easier system diagnostics and troubleshooting. The Ruud Achiever Plus™ Series Gas Furnace was designed to create the comfortable home you and your family have been waiting for. Industry exclusive features deliver peace of mind. Our furnace is not only reliable, it’s also quiet. So you can stay focused on what matters most,The Ruud Achiever Plus™ Series Gas Furnace was developed using our 360°+1 design philosophy, which means every detail of the product is meticulously evaluated from every angle. We consider the work that goes into installing and servicing our products, as well as how we can deliver the very best homeowner experience. And then we take it a step further. That’s 360°+1. And that’s why you can count on your Ruud gas furnace to bring you and your family years of comfort,Our gas furnace line was already recognized as best in its class**, but that didn’t stop us from making it better. We designed our new Achiever Plus™ Series Gas Furnace to provide your home with reliable, quiet comfort for years to come. Reliability is essential to your home comfort. That’s why we’ve engineered our gas furnace with the Plus One™ Ignition System. Our Direct Spark Ignition is a Ruud-exclusive feature that’s nine times more reliable than most hot surface igniters. 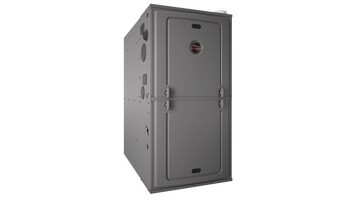 It’s also the same proven design used in commercial HVAC equipment and gas home appliances. Our patented heatexchanger is quick and easy to clean when needed by your local independent Ruud Contractor. And a clean furnace is a long-running furnace. s are a big benefit to both you and your Contractor. The Ruud Ultra Series Gas Furnace features PlusOne Diagnostics, our industry-first 7-segment alphanumeric LED display that simplifies troubleshooting. Just in case there’s a need, service calls are faster, which ultimately saves you money.